Let our front desk staff help customize your individual or group's spa experience package by combining any of our health and spa services to create an ultimate getaway. Don't forget to include a detox in the infrared Sauna and a break for lunch from the Glasshouse Bistro. Let us make a day of it. Our retreat day package includes a Hot Stone Massage, Body Scrub & Wrap, Signature Organic Eminence Facial and an Enhanced Manicure and Pedicure. We'd like you to have some time to take it all in, with a fantastic lunch at the Glasshouse Bistro (located upstairs at the Enjoy Centre). Combine our Signature Eminence Organic Facial with the Body Scrub & Wrap for a complete body re-awakening from head to toe. Pamper yourself to a new you with our Renewal Package that includes a Signature Eminence Organic Facial, Enhanced Manicure and Pedicure. Experience bliss with our Luxury Manicure and Luxury Pedicure as well as a soothing full body Paraffin Massage Treatment to relax your muscles and hydrate your fragile skin. Our custom organic facial is tailored specifically to meet the needs and demands of your skin. Skin is cleansed, toned, exfoliated, massaged, masked and moisturized. Exceptional anti-aging treatment for mature clientele. This facial uses Excellence Code and Excellence Cream to help restore skin cells, fights the sings of aging, dryness, loss of firmness, brightens, wrinkles and discoloration. Treat your acne naturally with this botanical-rich facial, packed full of organic ingredients that specifically address acne conditions such as excess oil, hyper-pigmentation and scarring. Potent time release encapsulated salicylic acid deeply penetrates pores to dissolve excess build-up powerfully and naturally, cleaning out blackheads and preventing future congestion. Our Acne Advanced Facial is a perfect first step to clearer skin. Yonka's new Time Resist anti-Aging facial is the perfect remedy to start combating visible signs of ageing. Each period of your life calls for an anti-ageing treatment. A new routine that combines Time Resist formulas with youth activation agents. Combine our Signature Eminence Organic Facial with the rejuvenating effects of Microdermabrasion to cleanse the old, tired outter layer of skin and reduce fine lines. This facial infuses oxygen, plant-derived stem cells, peptides and a high concentration of enzymatic botanicals into the skin leaving it luminous, refreshed and rejuvenated in just one application! The O2 Facial is a highly effective treatment that targets skin discoloration due to sun damage, removes impurities, helps reduce the signs of aging and is perfect for brides to have done the day before their wedding for that perfect glow. Add-On available for the Enhanced and Luxury pedicures. Scrub away tired, dull skin with an exfoliating treatment with customized Eminence Organics skin care products. The treatment is completed with a moisturizing masque designed to suit your skin health needs. Your back deserves just as much TLC as your face does! 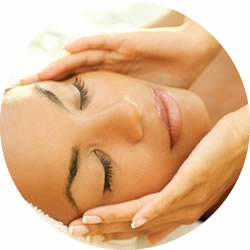 Treat it to a facial specially designed to treat its own common needs. Back facials can be beneficial in cleansing those tough-to-reach spots, targeting a variety of skin care needs such as clogged pores, back acne, and dehydrated skin. Each of our wellness therapists have a wide variety of techniques including deep tissue massage, relaxation massage, therapeutic massage and sports/injury massage to customize your healing experience. Katelun graduated from Alberta Academy of Aesthetics in June 2012. Graduating with certification in Basic, Advanced Medical Aesthetics. She enjoys and specializes in Advanced Pedicures for diabetic clients. With certification in aromatherapy, and reflexology. Late;un applies those skills to many of her services. Katelun has always taken pride in her career and education. She keeps up to date with all new trends. Continues her education in skin care and refresher courses, so her clients receive the highest quality service and best possible results with your visit to the spa. Skyler always had a passion for the beauty industry and after travelling for a year she finally began her education as an esthetician. Graduating school in June of 2018 she worked very hard to prove her skills and was hired at Wellness Within. She is a passionate, outgoing woman who always strives to do her best in every service. As she is working to build her clientele, she is known to go above and beyond for her clients. While Skyler progresses as an esthetician she would like to educate herself on Laser Hair Removal, and Injections. As you get to know her you’ll find that she is mindful to build a relationship with you, to provide more than just a spa experience but a friendship. Karen has worked as an esthetician at Wellness Within for the past 4 years. She completed her training in Ireland, graduating in 2008 with ITEC diploma in Body & Beauty Therapy, which is recognized throughout the world. She has advanced her training throughout the years, taking extra courses in a range of treatments such as Swedish Massage, Facial Electrics and Advanced Waxing. Karen specialises in the use of Hard Wax and also Eyelash Lifts/Perms. She has a passion for her work and loves to learn and progress in her career. She prides herself in being meticulous in her work and loves interacting and meeting new clients.